Shiodome is a modern area full of skyscrapers built in the early 2000s thanks to a government redevelopment plan, and it is today the main area of Shinbashi, a central district of Tokyo not far from Ginza. Shio-Site is a very modern area of Shiodome with a dozen of modern skyscrapers, housing mostly offices, including major multinationals, but also some hotels and shopping centers. This area is actually not so interesting for a tourist, but it can be a great set for photographers and lovers of modern architecture. Among the various buildings, the most interesting ones are the Nittele Tower, the Dentsu Building, and the Shiodome City Center. This skyscraper, 192 meters in height (32 floors), is also called Nippon TV Tower, as it houses the headquarters of the national broadcaster Nippon TV. You can have free access to the lobby, where there are some sofas and some tvs. Inside there is also a large shop (Nittere-ya) where to find various objects related to the characters and series of Nippon TV, and in particular of the anime Anpanman, very popular among japanese children. Outside the building there is also a great and unique clock designed by the great Hayao Miyazaki. A skyscrapers of 213 meters (48 floors), designed by the famous French architect Jean Nouvel. In the lower part of the building you can find the shopping complex Caretta Shiodome, which includes many shops and restaurants, a theater, and an advertising museum (floors B1-B2, free admission). On the 46th floor there are also some panoramic restaurants, and to get to this floor you can also use a panoramic elevator with a stunning view at night. On this floor there are also some windows to admire the view from above. During the Christmas period, in the lobby of this building are installed some amazing Christmas illuminations. A skyscraper of 215 meters (42 floors), on the lower floors there is a shopping center, on the two last floors some luxurious panoramic restaurants. At this link in English the list of all the restaurants within the building. Next to the Shiodome City Center there is a building which reproduces the old Shinbashi station (terminus of the first railway line ever built in Japan, Yokohama-Tokyo, in 1872), inside which can be found some historical information about the station and some restaurants. 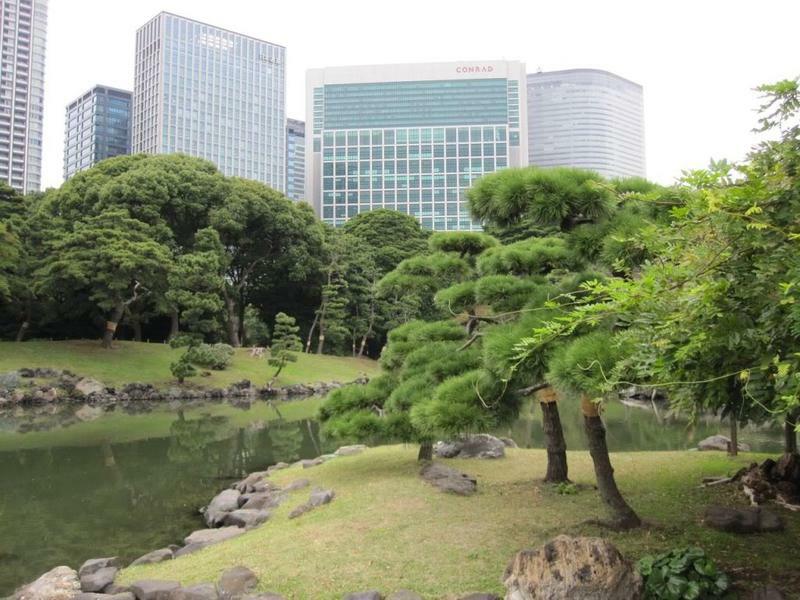 The largest Japanese traditional garden in Tokyo and perhaps the most fascinating one. It is located in the middle between the skyscrapers of Shiodome on one side, and the sea and the artificial islands of Tokyo Bay on the other side. A small garden located in a corner between railway tracks on one side and a highway on the other side, near the Hama Rikyu Gardens. As said in a plaque located inside, it is an "Italian garden inspired by the Tuscan Renaissance style." Inside there are some reproductions of famous statues of the Italian Renaissance and a fountain. 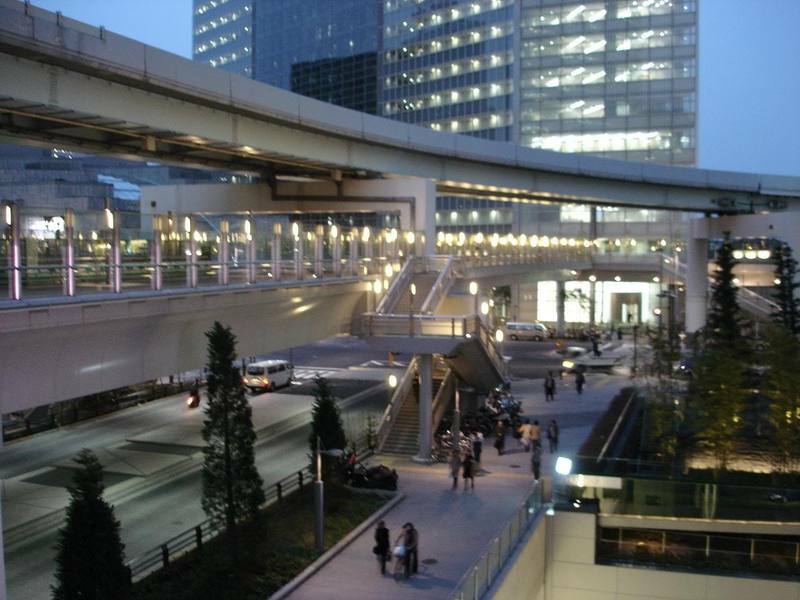 This area is located, as the crow flies, west of Shiodome station and the skyscrapers. It is called italian town because, according to those who projected it, it was built trying to reproduce a classic Italian or European architectural style. There are a few cafes, restaurants and shops. Many people do not know that in Japan, Panasonic makes not only cameras, televisions and other stuff like that, but also items of furniture, and this showroom showcases right this kind of things. Some high-level hotels are located among the skyscrapers of Shiodome. A very popular hotel among tourists, especially those on package tours, is the Villa Fontaine Shiodome Hotel. For an unforgettable night on the top floors of a skyscraper, with a panoramic view (from some rooms you can see the Tokyo Tower) we definitely recommend the Shiodome Royal Park Hotel. Shiodome station is served by the Oedo line (Toei Metro) and by the unmanned train Yurikamome to Odaiba island. Shinbashi station is an important railway junction, served by the Ginza line (Tokyo Metro) and Asakusa line (Toei Metro), terminus of the Yurikamome to Odaiba and also by some JR railway lines (Yamanote line, Keihin-Tōhoku Line, Yokosuka Line).